This is a classic Indian butter chicken recipe that has been simplified for you simpletons out there. It hasn't however, lost any of it's awsome flavor which I think is a pretty miraculus feat. Yummy. It has always been a bit of a mystery to me that you can cook butter chicken a million times but it will never be the same. Why is this? I'll make it one day and think 'wow, that was amazing, i'll do that again' then you do it again, and its like another dish, maybe even better than the one, who knows. 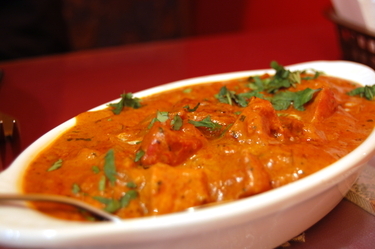 Ah, The wonder of Indian butter chicken. Enjoy it. This recipe comes courtesy of All-About-India.com , an awsome website packed full of loads of stuff all about India. Heat some oil in a frying pan and fry the onions untill they loose thier colour. Add the ginger and garlic paste with some water and keep stiring. Throw in the salt, tumeric and coriander powder and keep stiring. Pour in your tomato puree and then add the cashew and almond paste you made earlier.Pour in a little water (1/2 Cup). When it starts to bubble and boil it is time to put in the chicken. Add some more water (enough for the chicken to be covered). This is also a good time to throw in the orange colour if you wish. The sauce should start to thicken up. Hopefully the chicken will be cooked just as the sauce is thick enough. Turn off the heat and then put in the butter, let it melt and then serve hot with parathas or rice.